High standard of work presented by graduating BEng/MEng students. Team 'Towing Vehicle' emerged victorious during the poster competition for graduating BEng and MEng students on Thursday 24 January in ELG18 and ELG19. The winning mechanical engineering students are also part of Developing Technologies, a City-based engineering charity which designs, develops and delivers affordable and appropriate technical solutions for people in developing countries in response to requests from non-governmental organisations (NGOs) in the countries concerned. 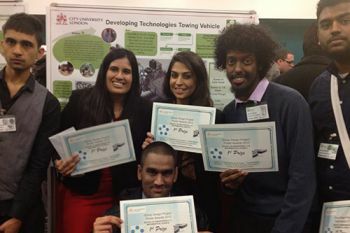 Team 'Towing Vehicle', comprising Priya Talwar, Resham Advani, Bruthan Mahenthirarasa, Meanan Ratnakumar, Mohamoud Samatar and Sultan Shafiq won a £150 cash prize and a certificate. Their Towing Vehicle is designed to tow a trailer that carries farming produce to local markets. It has also been designed to pull a furrow plough which will be used for tilling soil in preparation for seed planting. Dan Wright, one of the competition's judges, and CEO of Heliex Power, also gave a brief presentation to students about successfully combining engineering with entrepreneurship. Other judges were: Tim Young, Head of Marketing, School of Engineering and Mathematical Sciences/School of Informatics; Professor of Instrumentation and Sensors, Sanowar Khan; and Lecturer in Electrical Engineering, Dr. Lambros Ekonomou. "This year's poster competition was keenly contested and the standard of competition was very high. It brings together teams of students from the mechanical, automotive, aeronautical and electrical engineering disciplines and engenders productive and creative teamwork." "The poster competition is an ideal environment for our BEng and MEng students to develop all of the required capacities for the delivery of engineering solutions in the world of work. The combination of engineering, teamwork, presentation and marketing skills acquired during the competition will be invaluable when these students leave City." Team 'Flywheel' came second (£80 cash and certificate) and Team 'Copernicus' (£50 cash and certificate) took third prize.